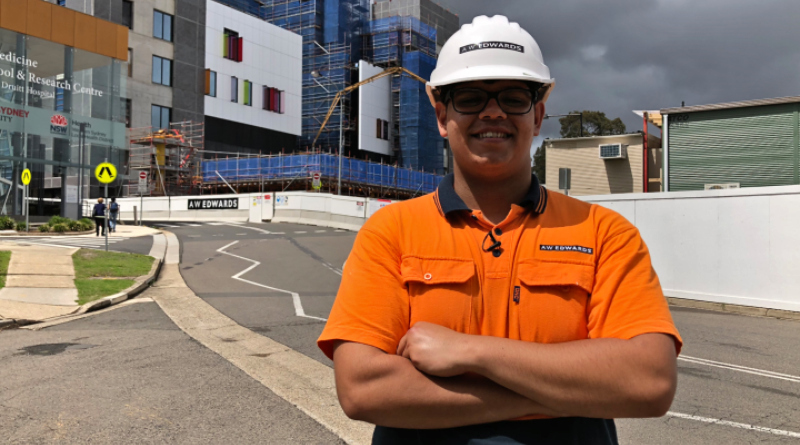 Construction of Blacktown Hospital’s new Acute Services Building has created more than 140 training opportunities for young people under 25, Indigenous people, apprentices and other workers as part of a unique skills development program. “Leaving school last year and coming straight into the workforce has been a dream come true,” Ochlan Parsons-King, first year carpentry apprentice and Master Builders Association of NSW 1st Year Apprentice of the Year 2018 said. Ochlan is one of more than 25 Indigenous workers to benefit from the program. Chris Horton, Project Director Health Infrastructure said the initiative provides ongoing benefits to workers in their construction career, and helps address existing skills shortages across NSW. “Overall, the Blacktown and Mount Druitt Hospitals Expansion Project will deliver about 7,000 direct and indirect jobs in health and construction,” Chris said. Forecasts suggest an additional 300,000 construction workers will be required nationally by 2024. The combined trends will result in a significant shortage of skilled workers if unaddressed. The initiative is an important component of the NSW Government’s efforts to address current and emerging skills shortages across NSW. Apprentice electrician Jasmine Cliff, who has benefited from the program, said the opportunities are “endless” and she is “very confident” about her future. “The skills that I’ve picked up on this job I’m sure I can take to another job and easily find work in western Sydney,” Jasmine said. A strong partnership between the local health district, Health Infrastructure and Blacktown Hospital’s major contractor A W Edwards has been a major contributor to the project’s success. “It’s been a really successful project from the point of view of providing opportunities for a wide range of workers,” said Michael Musarra, director of major contractor AW Edwards. “It’s very encouraging,” Michael said.